Luxury home buyers looking for a paradise of their own in close proximity to San Diego and all of its fabulous attractions would be remiss not to consider the real estate available in Coronado. With a slogan that reads, “Where Main Street meets bare feet,” Coronado is an affluent and exclusive community of new construction and resale homes in limited quantities. Located on a beautiful “tied island” and boasting extraordinary oceanfront properties, Coronado is only five miles from Downtown San Diego and numerous major freeways. This esteemed place is roughly 32 square miles in size and encompasses Coronado Cays, Coronado Village, and Coronado Shores, all of which are coveted addresses. In the 92118 zip code, Coronado is home to around 25,000 residents who enjoy a lifestyle that epitomizes luxury and prestige. Buy a home in Coronado, and you too can enjoy the seaside air, breathtaking views, and extraordinary amenities. 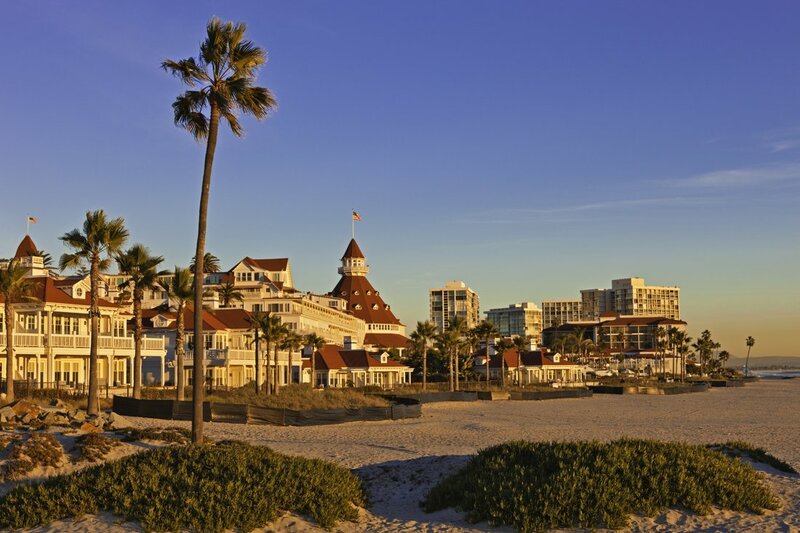 Because it is home to one of the best beaches in the country, Coronado is a popular tourist destination and has been since its establishment in 1886. It was the Coronado Beach Company that first recognized the value of the island's sparkling beaches and crystal clear waters, but it was the 1888 completion of the iconic Hotel del Coronado that put the city on the map. Today the Hotel del Coronado is one of three prestigious resorts here, the other two being Loews Coronado Bay Resort and Coronado Island Marriott. Other points of interest include Coronado’s beachfront boardwalk, a great place to ride your bike or spend a day soaking up the sun. At the opposite end of the island, you’ll find Coronado’s Ferry Landing and an array of over twenty art galleries, shops, and restaurants, as well as captivating views of the Downtown San Diego skyline. Among its many exceptional amenities, Coronado has phenomenal dining options. Distinguished dining establishment such as Vigilucci's Ristorante and Peohe’s afford residents and visitors alike with truly exquisite cuisines in which to indulge. In fact, all along Orange Avenue, you can find a multitude of five-star restaurants offering diverse culinary experiences. Orange Avenue is the main thoroughfare of the city and also boasts art galleries, theaters, shops and the Coronado Museum of History and Art. In addition to extravagant dining opportunities and cultural points of interest, Coronado also has enchanting recreational options. Coronado Municipal Beach, Silver Strand State Beach and Coronado Dog Beach all offer diverse activities as well as spectacular views. Because of the presence of the mineral Mica, beaches along the Coronado coast literally sparkle, but beyond the beaches, you’ll find opportunities for countless other activities such as kayaking, stand-up paddling, sailing, surfing and Venetian gondola cruises. Furthermore, the Coronado Public Golf Course is top-rated, and the Flower Show in the spring is a must-experience delight. And when the sun sets on this island paradise, Coronado Shores Beach Club and Fuse Nightclub, among other venues, provide an exhilarating nightlife and exciting entertainment possibilities. This relatively flat community has a sought-after small-town ambiance and proudly proclaims itself to be a car-optional city. Coronado Island is small enough that most attractions and amenities are within walking distance and there are numerous paths throughout the area for cycling and skating. With all of these alluring features, it is no surprise Coronado would also boast grand real estate. The luxury homes available in Coronado include lavish estates, posh condominiums and townhomes, dazzling two-story homes and sprawling beachfront properties. From California bungalows to elegant Victorian homes, the real estate of Coronado is sublime. Coronado luxury homes can easily boast over 10,000 square feet of living space and often have long lists of coveted amenities and special features. This exclusive island community affords a special few the opportunity to live an enchanting resort-like lifestyle. With old-world mansions, picturesque gardens, quaint boutiques, fine oceanfront dining and lavish luxury homes, “The Crown City,” is a must-consider destination for home buyers fortunate enough to afford its lifestyle. If you would like more information regarding Coronado, California luxury real estate, please allow us to assist you and contact us today.